The United States spent more on its military in 2017 than the next seven highest-spending countries combined; the land of the free, in fact, accounted for 35 percent of the entire planet’s defense expenditure, which totalled $1.74 trillion that year. The new statistics come from data released by the Stockholm International Peace Research Institute (SIPRI) in their May 2018 report: Trends in World Military Expenditure. 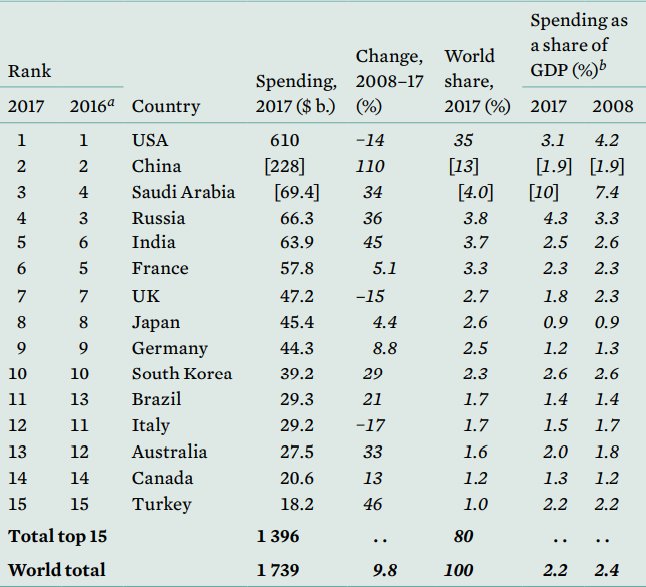 Chart shows the top 15 military spenders in 2017, their 2016 ranking, how much they spent, how much their spending has changed over 10 years, their share of global world military expenditures and their spending as a share of their GDP. The five biggest military investors — US, China, Saudi Arabia, Russia and India — accounted for 60 percent of military spending in 2017. Siemon Wezeman, a senior researcher at SIPRI, told Sputnik News that when it comes to the Middle East, there's a "bit of a yo-yo movement there. Sometimes it goes up very strongly, and then it goes down again when the oil prices go down." Meanwhile, as Saudi Crown Prince Mohammed bin Salman continues to shake up the monarchy, his country's spending surpassed that of Russia — a country the United States sees as the "central challenge," alongside China, faced by the US. Meanwhile, Russia's military spending dropped by 20 percent since 2016. "It's also important to keep in mind for NATO countries and EU countries, when they talk about threats and threats from Russia, that Russian military spending is about a third or even less of total NATO spending in Europe, which is 10 percent or less of total NATO spending," Wezeman said. "So keep that in mind when you think about the ‘Russian threats.'" "Long-term strategic competitions with China and Russia are the principal priorities for the [US Defense] Department, and require both increased and sustained investment, because of the magnitude of the threats they pose to US security and prosperity today and the potential for those threats to increase in the future," read the January Summary of the 2018 National Defense Strategy of the United States of America. 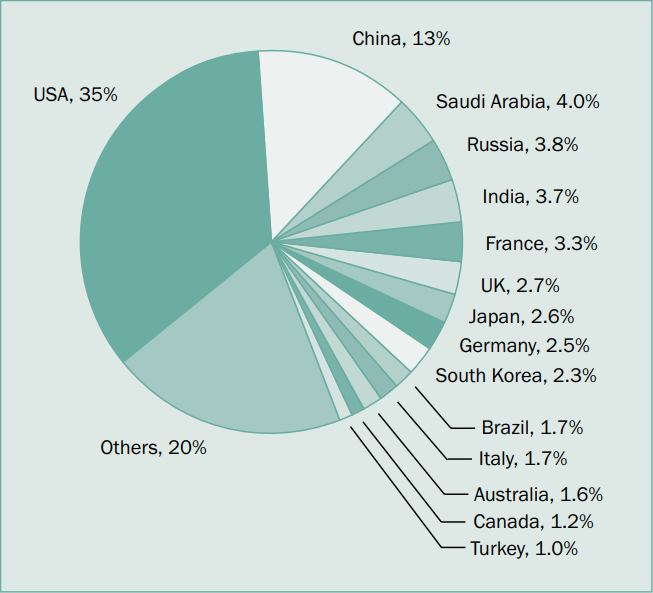 Pie chart shows the share of global military expenditure of the top 15 countries who spent the most on their military. India also surpassed France in its spending, which likely reflects the country's somewhat renewed tensions with its neighbors, Pakistan and China. The United States has both the world's largest economy and the world's largest military. It's also been at war for 221 of the 242 years the country has been around. Despite the war in Afghanistan showing few signs of winding down after 17 years, the US actually cut its military spending by 14 percent in those 10 years, though it still maintains a hefty lead. Comparing 2017's data to information from a decade ago reveals much about shifting power balances. China's military budget jolted by a whopping 110 percent and Turkey's spending increased by 46 percent, which can likely be attributed to its air and ground campaigns internally and in Syria. South Korea's spending shot up by 29 percent during the Obama era, due to increased tension with North Korea, but after the country's president Park Geun Hye was ousted in March of 2017 and the country's new president, Moon Jae In, pledged to end the 68-year-long Korean War with North Korean leader Kim Jong Un during their groundbreaking summit in April, it remains too early to tell how much, if at all, South Korea's military would be affected. While world spending is up by 1.1 percent since 2016, "Africa and Latin America are places where military spending is going down," Wezeman told Sputnik News. Brazil, the only South American country to make the top 15 list, stands apart from the others since it does not spend much money on war, per se. Much of its military budget funds the management of internal strife, especially in poor neighborhoods, called favelas. The top 15 nations, however, remained unchanged from 2016, despite a few swaps in positions. But when measured by spending in relation to gross domestic product, Saudi Arabia takes the cake, spending about 10 percent of its gross domestic product on the military as it continues to buy weapons from the United States and other Western allies to conduct its devastating war on Yemen.